Costa said today they are going to christen Costa Venezia in their hometown of Trieste on March 1 before they send it off for the foreseeable future to China. The ship is the first Costa has purposefully designed specifically for the Chinese-sourced market. The Chinese enjoy trying new things, going new places and have a desire to travel to Europe and Italy in particular. Costa Venezia will help satisfy that desire simply by stepping aboard. Much of the ship resembles Italy. You can see what a unique ship this is going to be in the renderings below. Details appeared in the December 7 issue of Cruise News Daily. 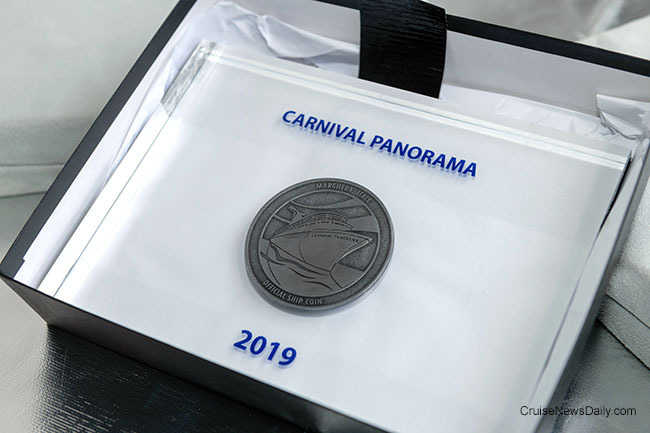 Carnival Panorama floated today for the first time at Fincantieri's Marghera shipyard, marking the end of the construction phase. The focus will now turn to interior work for the rest of the time until the ship's delivery in the fall of 2019. Photos courtesy of Fincantieri. All rights reserved. May not be copied or used without express permissoin. Norwegian Cruise Line Holdings has announced a partnership with the Huna Totem Corp to build a second cruise ship pier at Icy Strait Point, Alaska. 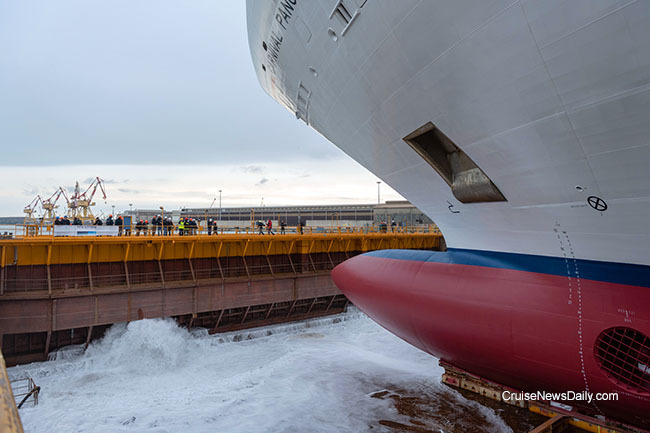 The pier will accommodate Norwegian's largest ships, the Breakaway Plus-class, and is scheduled to be completed for the 2020 summer Alaska season. The complete story appeared in the December 6 issue of Cruise News Daily. Carnival Corp to produce a second season of "La Gran Sorpresa." The Port of Galveston officially announced a long-term agreement today with Royal Caribbean that will result in the building of a third cruise terminal at the port, although a specific design, costs and lease terms haven't yet been settled. Details appeared in the December 5 issue of Cruise News Daily. Following a new agreement with the Port Authority of Santa Cruz de Tenerife Carnival Corp will acquire an interest in the two-year-old cruise terminal at Santa Cruz de Tenerife and manage it, as they do in a number of other ports. Ritz Carlton Yacht Collection has chosen the name Azora for their first ship. Celebrity Edge officially became part of the Celebrity fleet tonight when it was named at Port Everglades by Nobel Peace Prize Laureate Malala Yousafzai. Tonight Celebrity's first new ship in six years is sailing to the Bahamas with probably the cleanest bow of any new ship, because Celebrity broke a custom-made 18-liter bottle of Badoit French mineral water against Edge's “Parabolic Ultra Bow” rather than the traditional champagne. Details appeared in the December 4 issue of Cruise News Daily. Princess Cruises said today that Regal Princess will be the second ship to become Medallion Class, meaning it is fully online with all the wonderful things Ocean Medallion can do for you. It will achieve that milestone on February 17. Caribbean Princess was the first, going online for all passengers in September of this year. Costa's new television commercial airing in Europe (but not the US) starring Penelope Cruz. Catch it below. Details appeared in the December 3 issue of Cruise News Daily.